With a spacious interior that’s equally as beautifully designed and well laid out as it is safe the Toyota Auris is a safe bet when it comes to choosing a new family hatchback. 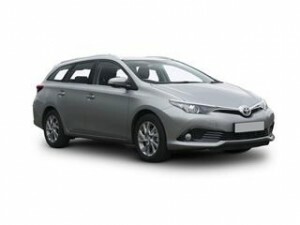 Offering excellent value for money the Auris comes with an impressive choice of engines. For fuel economy the 1.4 litre Diesel comes out on top of the range returning up to 80mpg. The hybrid model boasts figures returning up to 78.5mpg as well giving you choice. Automatic and manual gearboxes are an option with most engine choices too. The 1.6 litre Diesel engine provides the best in terms of 0-62mph taking just 10.5 seconds. This small hatchback is easy to drive and won’t fatigue on long motorway cruises. The light steering offering easy steering and manoeuvring. The interior is sufficiently practical and does the basics well with a height adjustable driver’s seat and steering wheel. The Auris comes in 5 trim levels each one adding to the modern feel cabin. The basic version “Active” has air conditioning, LED daytime lights, hiss- start assist and electronically operated door mirrors as standard. The boot is well shaped making it easy to fit large items into and with 360 litres to play with its ample enough for largest objects. The rear seats fold flat so you get access to 1,200 litres of space. Coast2Coast Cars has exclusive and direct access to a range of offers for the Toyota Auris, this includes any spec and any model. Why pay list price when you can use our online offers quote system you could save £1,000’s. It couldn’t be easier, simply fill in the form, choose your spec and view the final price of the Toyota Auris you desire. See also what finance options from Toyota are available with something for everyone subject to status and credit history.